On the New River Trail in Virginia, a business owner taught me a valuable lesson on ways to improve performance. After renting bikes from an employee at her shop, we experienced gearing problems that worsened as we traveled. During a notable struggle, a couple stopped and asked if we were OK. I referenced the mechanical difficulty and the woman (who happened to be the shop owner) recognized the bike as one of her rentals, traded bikes with me, and gave me instructions on what to tell her employee when we returned. Had the owner been inside all day, she would not have seen the gap between the ideal experience and the actual one. Getting out of the office is one way to learn what is happening in the field and quickly solve problems. I am sure you have had similar experiences, noticing actions others could take to improve their performance, whether they own a business or work for an employer. When you are in the midst of day-to-day busyness and occasional work-related chaos, the path to better results may not be immediately obvious. If you want to improve your performance, you must see what your employees are doing and how customers are using your products, at least occasionally. Get out of your office and travel to the sales, distribution, or production floor, wherever your people are. Observe how sales and service employees interact with customers, distribution folks organize inventory and fill orders, or production team members set up machines and check quality. And talk with people, employees and customers alike, to allow them to share their perspectives (whether you agree or not). You’ll likely discover a few discrepancies between what you expected and what is really happening. Drawing on these observations and conversations, tweak or restyle the environment, workflow, procedures, systems, etc. to assure that you and your employees are able to meet and exceed performance targets. Understanding your purpose within the broader context of the company’s mission can help you make better decisions faster. When you grasp how your job affects your employer’s ability to serve customers, for example, you can act more intentionally and less robotically when quirky requests arise. You definitely need to master the content of your job description first. Otherwise, you’ll seem like a lazy, sloppy worker who touts that she gets the "big picture" but can’t handle basic duties. But knowing the overarching strategy of your company, team, and job function can help you navigate complicated issues and show others that you are capable of higher level responsibilities. Conduct meetings that propel you forward, instead of keep you struggling with the same tired predicaments. To get there, you’ll need to move beyond the good but incomplete guidance to prepare and stick with an agenda for an effective meeting. Take immediate action on decisions made at the meeting. For more discussion on how to run a better meeting, read the book "Read This Before Your Next Meeting." Get more done faster by automating a routine activity. For example, create an email template for certain types of inquiries, build a knowledge base that your staff can reference for routine situations, or create an Excel spreadsheet to handle certain types of calculations. Naturally, your efficiency will increase when handling these matters. But more importantly, because you are not using brainpower on mundane tasks, you will be able to tackle more challenging assignments. Discern when you need to sprint (go all out, for a short period of time), instead of pacing yourself steadily for a long race. There are moments when you need to make quick decisions, days that you should go the extra mile, weeks when you need to accelerate your thoughts and actions to beat a deadline, and high-volume seasons when you must work extra hours. You can’t go hard all the time. A consistently tired, burned-out employee doesn’t perform well. But there are times when you need to apply extra, concentrated effort. Your boss may tell you outright when you are expected to stay late, your colleagues or customers might hint at their needs, or you may recognize situations that could benefit from intense focus. Being able to manage those short bursts and keep them from becoming routine can help you to improve performance at all times. No matter how adept you are at using technology, you can broaden your capabilities. Some knowledge can be put to use immediately for better results. For example, you might take 15 minutes to learn how to use an online survey tool, and another few minutes to design and send a survey to a group of customers. But even if you have no urgent need, becoming more skilled in tools you already use or getting familiar with new applications can guide long range planning or prompt ideas about ways to harness technology for a long standing issue. Whatever your take on corporate mandates to encourage add-on sales (that is, asking if the customer wants fries with the burger or an extended warranty for the electronics purchase) or push a higher priced product when the basic one seems fine, you can learn to upsell while building great relationships with customers. Learn and show that you know as much as possible about your company’s products and services, marketing position, differentiating features, and real world applications compared to competitive offerings and substitutes. Gain expertise in how customers use products and services in various scenarios (whether these are manufacturer approved uses or not). Listen to customers without making assumptions and ask probing questions about their requirements or anticipated usage, preferences, and expectations. Make a recommendation in a non-pressured way that allows the customer to affirm (and buy!) your selection or give you more information about concerns, needs, etc. so that you can formulate even better advice. Most people appreciate a tailored approach that clues them into why certain items could be beneficial and why certain features cost more, instead of being offered products indiscriminately. Einstein’s take on a cluttered work space ("If a cluttered desk signs a cluttered mind, of what, then, is an empty desk a sign?") may inspire you to leave a mess in your office. But you may not be as efficient as you think, even if you know which pile contains what pieces of information. There’s a psychic cost to having random stuff around, which may include fear that you’ve forgotten something or missed an important deadline. Even if you have high productivity with a messy space, most of your coworkers will still consider you unorganized or even lazy. Generally, you’ll need their cooperation with small matters and collaboration on major projects, so decluttering can improve internal relationships and win the support needed to achieve performance targets. Read books, take classes, participate in industry events, earn certifications, etc. Even if the latest research tells you things you already know, you’ll be able expertly articulate your position and increase your credibility among peers, leading to better communication and results. And, even if you disagree with the latest management or leadership techniques, knowing what people are talking about when they mention "blue ocean strategies" or tell women to "lean in" is useful. More significantly, however, you may learn something new that you can apply to improving performance immediately. Let your boss know about insurmountable obstacles. Just be sure that you’ve done your research, experimented with different methods to overcome these challenges, and pinpointed underlying problems. And, ideally, when you talk about obstacles, present a proposal with a solution and the resources required for implementation. There’s a line between communicating roadblocks and shirking your job duties because of everyday difficulties. So, when you voice concerns, be sure to display innovative thinking and not tired exasperation. If your boss is reasonable and you’re willing to try a fresh approach, you may be able to put an end to pervasive problems and achieve unprecedented outcomes. If you’ve gotten even a smidgen of negative feedback in the last several months, check to see whether you’ve successfully made changes envisioned by your boss or customers. You may have quickly made adjustments that led to obviously superior results. But you could have misinterpreted comments and fixed unrelated issues. Or, you may have dismissed concerns as fleeting grumpiness whereas your boss considered them clearly defined needs for improvement or your customers thought of them as deal-breakers if left unfixed. Whatever you did after receiving feedback, starting this conversation should help improve your performance. You may discover that adjustments have been well received and your boss or key customer appreciates your initiative, leading to greater connection that helps you work more effectively. And, well, if you totally missed the meaning of the feedback, it’s better to find out now, instead of during an annual review or customer meeting. Look at performance goals to refresh your memory, refocus your efforts, and reenergize your resolve to make things happen according to plan. Annual objectives are often developed using ideal circumstances as the norm. But as the year progresses, priorities shift, crises erupt, budgets get slashed, etc. So, even if you think you are doing all that your company requires based on immediate feedback, you should still revisit those documented goals. 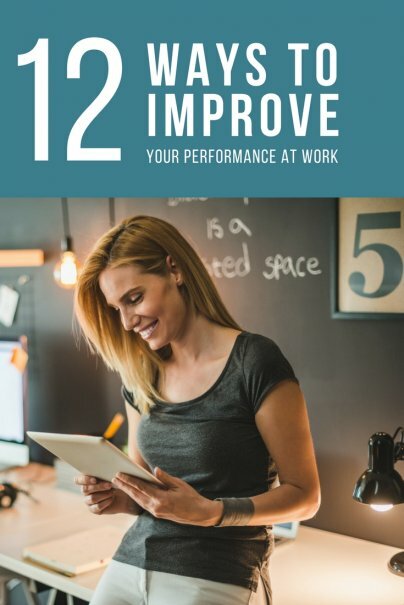 You could discover that the work habits you formed — when dealing with temporary setbacks, for example — have prevented you from meeting performance standards. You might notice that you were supposed to complete a couple of one-off tasks, like attend a professional seminar or develop a short list of alternate vendors for a routine purchase. You may recall that your boss put a high priority on a project, which seems to have stalled since then. Take action to adjust your routine to meet and exceed those standards, get those small but important chores completed, or raise the urgency of the project with your boss. The vision of the business owner I encountered on the bike trail was surely for patrons to enjoy a carefree ride, not struggle with broken equipment. She wasn't perfect, but she made things right as quickly as she noticed a mistake. Like her, pay attention to what's happening around you, and you'll likely find ways to improve your performance at work. What have you done to improve your performance at work? You will only get the most out of her career if you get fully involved in all aspects inside and outside the office. I am young and just getting into my job, and I find that I always learn more when I'm interacting with others outside of the office setting rather than in it. Great advice! Thanks for your insight. If you really love what you do, it's a pleasure to get together with colleagues outside of normal workdays -- with the bonus (as you mention) of learning even more than you might on the job. Most people are willing to share their knowledge so if you are willing to listen, you can really learn a lot. Thank you so much for these great tips! Number 9 is my favorite, but I think all of them will help me. Glad the article is useful to you. #9 can improve performance at work plus help you to contribute in any environment (your own business or another employer). Talking with your customers is probably one of the best ways you can improve your work. Always be open to feedback, and show your customers you care! Many business owners, managers, and leaders can forget how their customers use the products they are selling, and talking directly with customers is a great way to improve products and service. Understanding another person's point of view -- especially your customers! -- is critical. So you are right to say that getting feedback from customers can help improve performance (plus closing that feedback loop to see whether changes identified were implemented successfully). Some mistakes I see companies make in this area are 1) asking just one type of customer; 2) rationalizing company or employee behavior as a defensive tactic. Instead, listen for understanding and then take appropriate action. Nice tips! Well, through learning you can improve your performance at work because performing any work without any experience is always a tough task. So in that situation you can learn and apply it practically. Thanks for reading! I find that I can learn (and improve) faster if I can apply new concepts to my day-to-day work. Sometimes there is a lag between learning and application but the faster you can close that gap, the better. I love this article, it was an excellent read. Finding a job is just the beginning, what matters most is being able to perform up to the expectations. I came across this article the other day that I found very helpful as well. I like what said about automating one aspect of work. I work for Barnet Removals as a customer service representative. I received daily requests from customers and noticed a pattern in the way customers ask for our services. In order to more effectively respond to those requests I wrote templates of ready answers and saved them on TXT file. Now when customers email me I used those templates to reply to their emails. It improved the speed in which I can respond to my customers and increased the number of customers I can process daily. A great article with great tips. What do you think about making a schedule for the day-to-day work? Would this be improvement in the efficiency or it will limit the freedom of work?